For the past several weeks, the eight graduate students in MFA Cohort V have been in residence with Divadlo Continuo Theatre at Plum Yard Theatre outside of Prague, Czech Republic. The students have been working under the guidance and direction of Continuo company members to devise and create a full length original performance, set to premier this weekend. 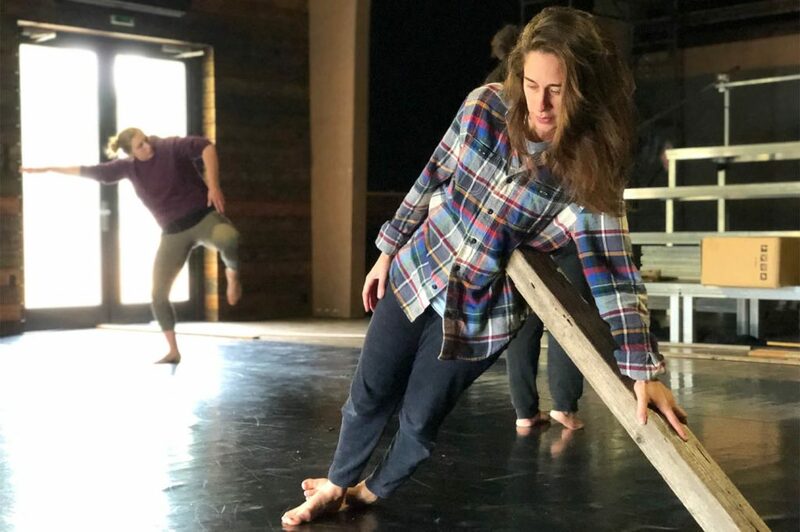 Their performance, titled What’s Left Behind, will serve as the culmination of 2+ years of training, collaboration and performance in the MFA in Physical Theatre and concludes the practical portion of the program. We borrowed some precious time from the students amidst their final rehearsals preparations to hear a little about the process and production. In the MFA NL being published on Thursday, October 18, we’ll take a more in-depth look at the residency with Continuo. We’ll also ask students to reflect on their 2+ year journey in the MFA program and look ahead to the opportunities that await them. What was the source and inspiration for your final performance with Continuo? Can you describe the creation and rehearsal process? LINDSEY: The group was prompted to bring individual “urgent” topics we’d like to see addressed on the stage and the creation process started around this discussion. And Pavel, of course. RUTA: We started to bring ideas, topics which are important to us. We started to create material for the show. We worked on solos, duets, trios and group scenes. Then we started to combine all the material; we had a “puzzle” to connect. SLOANE: Our final performance is titled “What’s Left Behind”. It’s described as a research on both, individual and group experiences, behaviors, stories and ideas related to the question of purpose, self-determination and the encumbrance that heritage has on people living in this modern society. HEIDEE: … we have a lot of material. In these moments we are producing new material based on physical elements almost everyday. We share our compositions – solos, duets, trios, vocal scores, etc. – and from this material we extract information. This is backwards from traditional theatre that starts from a cerebral place, an idea that is then translated to the body in a composed space. Here we invite the body into a situation and observe. What is the material giving to us as proto-audience members? What associations does it bring? How can it be deepened or developed further? In this way the “story” or theme arrives from the body. We’ve titled the show “What’s Left Behind?” because our early associations with the material were combining into themes of individuals against societal constructs; how the individual deals with isolation, chosen or forced, from his or her social norm. What’s beyond the system? How do we get there? What do we leave behind? NICOLE: The title is What’s Left Behind and the description from Continuo is as follows: “History, buildings, ideas, rules, stories and much more. As coded genetic messages we inherit in our DNA multitudes of information that, from generation to generation, travel time until they reach us. What we discover and meet daily during our lives was left by those who were here before us. We live in the scenery of the past, eras that we both belong to and are strangers to. The ones who have left this behind for us are gone. What do we do with this heritage? Do we throw it away as junk, restore it, let it be? Or do we build something new of our own? What will be left for the ones that will come after we are gone? FAITH: The show is called “What’s Left Behind” and it explores the themes of what is left behind after we are gone, as well as what’s left behind for us from previous generations. Our set, as well as many of the pieces in the show, involves the use of many many wooden planks of all different sizes. How would you describe your thoughts and feelings as you prepare for the final performance of this journey? RUTA: My feelings are diverse. Most of the time I worked hard to understand and improve myself and my body. It was super challenging working long hours and body got tired. But the results in the body you can notice very easy how movement got bigger, different qualities arrived. LINDSEY: I’m excited and terrified, just like any other transitional phase of life. Ready to get started, professionally. SLOANE: I think that most of us are feeling the pressure to make our final performance something special, which is causing all sorts of emotions, but I’d say that at this moment I’m feeling a combination of nervous energy and excitement. FAITH: I feel sad about everything coming to an end, but I also feel that we are ready for whatever the next step may be for each of us. I feel really excited about the potential that our last show holds, I feel that with Continuo we are the most creative we’ve ever been! NICOLE: Sentimental! I feel the end of our time together fast approaching and it has me thinking about the love we’ve shared and the impermanence of life; how this very fact renders these next moments so incredibly tender! Be sure to check out the Accademia dell’Arte MFA Newsletter being published on Thursday, October 18. Interested in graduate training at the Accademia dell’Arte? We’re accepting applications for the incoming cohort for the MFA in Devised and Physical Theatre. Email: mfa@dellarte.it using the subject: MFA in Physical Theatre Cohort VI to get started.